Since releasing my course Mixing with Reverb, I’ve received a few emails with different questions about reverb, so I thought I’d share some of them here, as well as my answers. Feel free to leave any reverb questions of your own in the comments below. 1) Some reference guide advised using the same reverb and type on all tracks to avoid the sound of each track being recorded somewhere different; on the other hand, another guide suggests using different reverbs and types for best sound and then making the mix work from there. Which is correct? The beauty of art is that we get to choose the colors we want to paint the canvas. Rather than think about the “right” way or “wrong” way to do something, let’s think about the effect our choices create. So if we send everything to the same reverb what does that do? It puts everything in the same space and imparts a bit of the same color on every track. For certain types of recordings, this is ideal. If I’m mixing like a Lumineers record that wants a gelled “in the room together” kind of vibe, even if I have a spring reverb on my guitars and a short plate on my vocals I still might send everything to a single room reverb as well. But if I’m doing something heavily synth driven I don’t necessarily need things to sound like they’re living in the same space. I can use reverbs that compliment the source and not worry too much about whether or not it’s realistic or gelled. I have a little trick. If I’m using many different reverbs as I would on a Pop record, I’ll solo the reverb returns and contour them with a bit of EQ so that they all blend together instead of flop all over each other. This way I can have a lot of reverb going on without crowding the record. We can figure this out ourselves. Let’s take your reverb and set the signal to 100% wet — so we have no direct sound. We could do this on a single snare drum hit so we hear the results very clearly. Now, let’s turn the pre-delay up to a high value like 200 ms. What do we hear when we play back the sound? We hear a diffuse, filtered version of the snare (the early reflections), and then a moment later we hear a reverb tail (late reflections). This shows that the pre-delay is the time between early and late reflections. 3) What are some of your most commonly used reverb types on vocals … plate, room, spring? Do you ever use multiple reverbs on a lead vocal? All of the above. It’s more about what I’m trying to get from the vocals. If I want something that’s really poppy and forward — I like plates, so I use that a lot. If I want something more natural, I’ll use a room or a hall depending on the context of the record. And if I want something vibey, I’ll go for a spring. I usually pair my vocal verb with a delay so that I’m getting a lot of ambience without swamping the record. The delay feeds the reverb send as well, so there’s the same reverb on the vocal delay as there is for the vocal itself. I don’t compound multiple reverbs on a lead vocal too often. Sometimes I might blend two together because I can get a little more immediate reverb sound and then a quick taper, and the chorusing effect between the two reverbs can sound good. And fairly often I’ll switch from a tighter reverb during verses to a wider and longer reverb in the hooks. But in general, I like one really solid reverb coupled with delay. 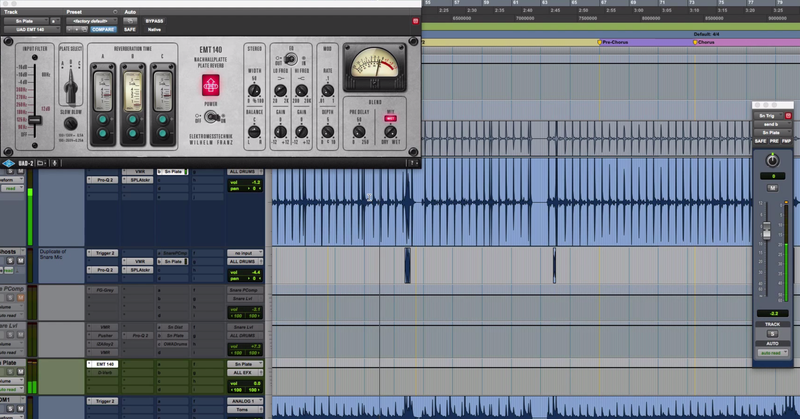 4) Do you ever follow your reverbs with an EQ or Stereo Widener? Do you usually add harmonic saturation or other effects? Or is it something that you rarely resort to? 5) Have you mixed any records dry lately? I mean, like keeping the vocal very upfront with no, or almost no space behind it? No … my clients are mainly in the urban, pop and reggaeton world right now. They don’t do dry. Which is a shame because I think dry can be more emotive than super verby sometimes. But I have a lot of fun with designing reverb for a song, so I’m not mad at it. 6) Do you have a favorite reverb plugin? I use a number of different reverb plugins. I use the Lexicon PCM series for colored reverbs that I want to stand out, Fabfilter Pro-R for a more open/transparent kind of reverb sound, D-Verb for a hashy kind of reverb sound, and the Slate Digital reverb if I’m looking for an emulation of a specific reverb that I don’t have as hardware (or happens to already be in use).